Choose the right promoting tools and methods. After you picked the advertisers, applied to their programs and have been approved by them, you must now select the right promoting tools and methods. You can do this by accessing Affiliate Programs section and click on one of the programs that you are interested in. Here you will find detailed information about the campaign you have just applied, including the tools provided by the advertiser. 2Performant provides three types of tools that helps in generating conversions: banners, affiliate links (quicklinks) and product feeds. They can be used to generate sales and conversions. Based on your choice, place the tools and, if the case, their codes in your own website. Banners are the best used tools by 2Performant affiliates. They broadcast visual messages in the most efficient way possible. Our platform supports both static and dynamic banners. Static banners may be .jpg, .png, .gif while the dynamic ones have a .swf format. Try to choose the most targeted tools to promote a product or a product category. In this regard, affiliates can use Quick Link – a tool that helps you create your own links for certain products or specific categories. Affiliate links or Quick Links, as they are named in our platform, are those links that you take from the advertiser’s website that you wish to promote, and transform them in affiliate links, through your 2Performant account. Besides banners or affiliate links, you can also create dedicated sites for the products or services you want to promote. A site or a dedicated landing page may significantly increase your conversion rate. A very useful tool for this part is Product Feed – they can basically help you create your own online store, through which you can promote services/products from advertisers. Product feeds have numerous functions inside our platform. You can take a feed and use it for price comparisons sites, cash-back sites and/or coupon aggregators. Bookmarklet is another tool with the help of which you will be able to create unique links associated to your 2Performant account and the affiliate program you wish to promote. In other words, our platform will know that because of you someone landed on an online store’s product page, and if that visitor will make a purchase, the commission is automatically linked to your account. 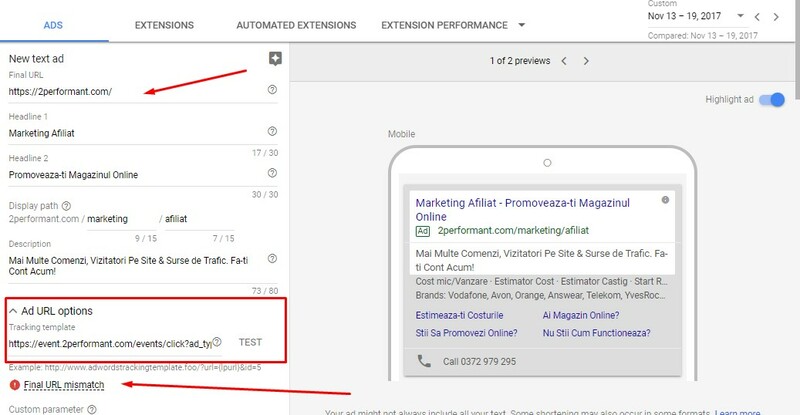 If you are planning to use these tools in AdWords campaigns, you can check the advertisers who allow it in the Affiliate Programs Directory, as shown below. It is recommended to ask for more information, by sending them a message through our internal messaging system or by using their contact information. Also, if you need personalized banners that you think they might increase your performances, you can also always ask the advertisers for them. Depending on their interests and promoting policies, they can either accept or deny your request. But it never hurts to ask! How can I promote my advertisers? When advertisers register in our platform, they establish their own policies regarding affiliate promotion, which could include stipulations about promoting through search engines. Every affiliate who enrolled in those programs is required to follow and respect these collaboration policies! In 2Performant there is only one restriction regarding AdWords campaigns: affiliates shall not bid in Google AdWords or any other search advertising platform on keywords containing the Advertisers’ brands (or variations) or the Advertisers’ domain names (or variations). In this way, these terms shall always be listed as negative keywords. How do I create a text ad if I want to do affiliate marketing with Adwords? Careful when copying the affiliate link. You want to add https: in front of it, in the Tracking Template field. Even if you receive an error when you press the Test button (Final URL mismatch), you can save the ad and it will work correctly. You see that message due to the fact that there is a difference between the URL and the Final URL in the tracking template. But no need to worry. Your only concern should be to optimize your campaigns so you can see those commissions running. Can I do affiliate marketing with Adwords for any advertiser? Not all advertisers allow this type of promotion in their affiliate programs. However, there are many that accept Adwords. You can find them in the affiliate programs directory – Affiliate Programs. Here you can filter out the Promotional Methods using Google PPC. One of the most convenient ways to promote 2Performant advertisers is by promoting them on Facebook. There are three main ways: using your personal Facebook account, a dedicated Fan Page and/or Facebook groups. The moment you received approval from the affiliate program you’re interested in, you can get to work! Once you have decided on where you want to affiliate on Facebook, you can start posting. Posts are made exactly like in normal Facebook accounts. You can start posting text, photo+text and using affiliate links generated through our platform. Visit the advertiser’s website and browse to find a product or product category you are interested in promoting. When you land on the product page you wish to share on Facebook, use the bookmarklet to insert your affiliate link inside the post. In this way, you will be able to create a community interested on a certain niche. Our suggestion is to not assault your fans by placing only affiliate links, but try to provide relevant information along with them. Thus, your users will chose to actively follow you and gain trust in you and the offers you’re promoting. Be creative with your posts and always take into account your group members and the public you are posting for. Always think of information that will interest your readers! How can I promote advertisers using my blog? One of the effective ways of affiliation for people with writing talent is to promote advertisers’ products through a blog. The most used blogging platform internationally is WordPress.com. Once you have created your blog, it must have some content; and not just any content but an original one that really brings something extra to the already existing information on the advertisers’ sites. After you created your blog, personalized, customized and started writing blog posts, it is time to connect your blog with 2Performant advertisers which you decided to promote. Depending on the management policy of each affiliate program, you’ll have access to the promoting tools available. For a blog, you can use tools that are quick links and banners. Quick links can be used to add an affiliate link over a word or phrase inside the blog post and/or the image that you want to insert in the blog post (if the case). However, do not overdo with the number of links added in the blog post, if you want to not be penalized by search engines. If you don’t want to add a quick link over a word or phrase in the blog post and you prefer to share it through an intro such as: Find out more HERE _link_ or Follow the link bellow _link_, you should embellish a little the 2Performant link. You can do this by generating, based on 2Performant link, a short URL. For this, I recommend you to make an account on https://bitly.com/ or, if you have a Google account, you can use https://goo.gl/. Through a dedicated account you will be able to find more statistics regarding the short URLs you’ve generated. Banners are images with links and dimensions that you can take directly from our 2Performant platform. They are created and uploaded into the system by each advertiser separately. Go to Banners section from your 2Performant account and look for the advertiser whose banner you want to display. 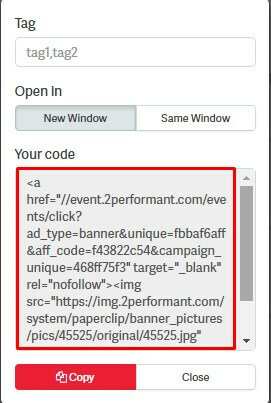 Once found, use the advanced option next to it and copy the banner’s code that begins with href=’http://event.2performant.ro. This generated code must be added to your blog post using the HTML tab. Subsequently, the banner can be modified just like any other image that you insert in your blog post, except for the dimensions. The main advantage of affiliating through a blog is that there is no financial investment required. The only investment you have to do is… in time. In order to be successful you must be diligent in all your blogging actions that you do, from regular posting to promoting the new blog posts. You can merge promoting on Facebook with the blog posts. After you finish writing your blog post, you can also promote it on your Facebook account, page or group. Thus, your users will be more likely to see new blog posts. And now you can start making conversions! Commissions are obtained when visitors directed by you, through promotional tools, make online actions set by the advertiser, and the latter approves the action as valid/real.